Amanda ‘The Real Deal’ Serrano, the six division world boxing champion is to return to MMA, taking on Mexico’s Erendina Ordonez. The fight will be in the Comabate Americas women’s flyweight division on October 13th. The 29 year old Puerto Rican, Serrano, makes her rerurn to MMA after an unanimous decision win over Yamila Esther Reyonso of Argentina for the WBO Junior Welterweight World Championship. The bout took place at the Barclays Centre in Brooklyn on September 8th. 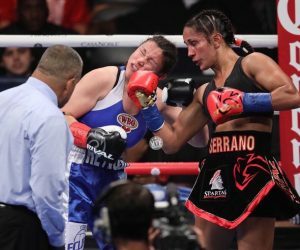 With her win, Serrano joined an elite group to have claimed six world titles at six different weights, joining Oscar De La Hoya and Manny Pacquiao. With one MMA fight to her name, so far, Serrano will be hoping to go one better than her debut bout. On April 13th, Serrano faced Corina Herrera at ‘Combate Estrellas ‘ in LA, the bout finishing in a draw. Serrano’s opponent this time out, Ordonez, is a three time San Shou style kickboxing gold medallist.